Once again any and all help will be greatly appreciated. Thank you. A crack has made it to the bore from the waterjacket and you just can't see it or more likely the warp has allowed mixing right over the gasket surface. Magnaflux will show where the crack has made it to but I wouldn't put the time into the block. I would go after a junkyard long block. are you thinking that the crack I found is on the block? If so that's not the case and I'm sorry if I wasnt clear on it. The crack is in the head between 3&4. The gasket blew between 2&3 and out of the side of 1 into a water jacket. No I can see the head crack which isn't good. But there may be another crack in the block that you can't see. If you've had mixed coolant oil for a while the block may not be worth rebuilding. Just in terms of cost a running motor may be the cheapest option. 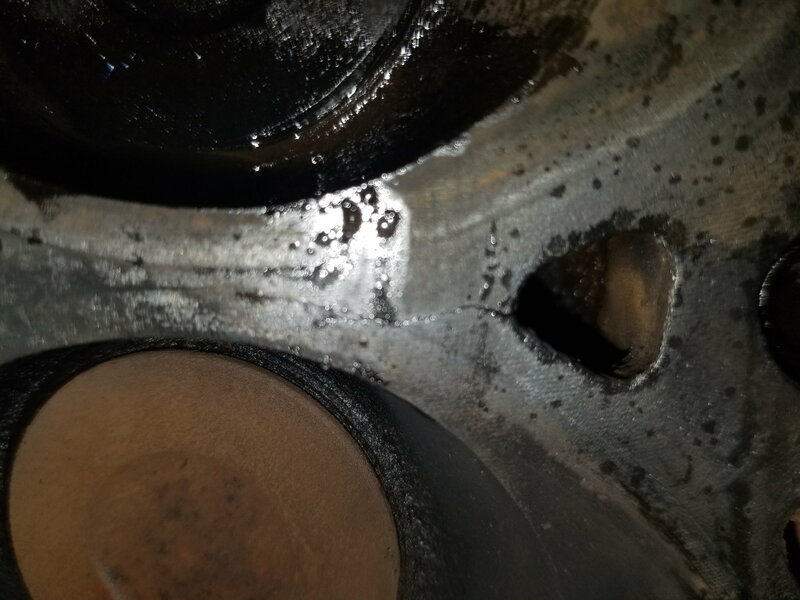 If you have a crack in the coolant passage to wear the gasket seals the cylinder, then coolant would go into the combustion chamber and some could drop into the crankcase. If you have a warped head, then the same could happen. Is the block warped? You could take a pick and run it across the block to try to find a crack provided that there is one. I believe it is most common for a crack to occur between 3 &4 on the top side of the head (under the valve cover). This is more common in the 2000 and 2001 engines however. In that case antifreeze will flow down one of the oil gallery passages, typically onto a cam bearing, and then into the oil sump. Often it’s reported that cam damage results if run long in this condition. You might see an antifreeze stain or different colored path from the area of the crack toward an oil return hole. The apparent crack in one of your photos is on the cylinder side. That and warp of the head indicates a potential significant overheating event. I would not worry much about the condition of the head gasket. 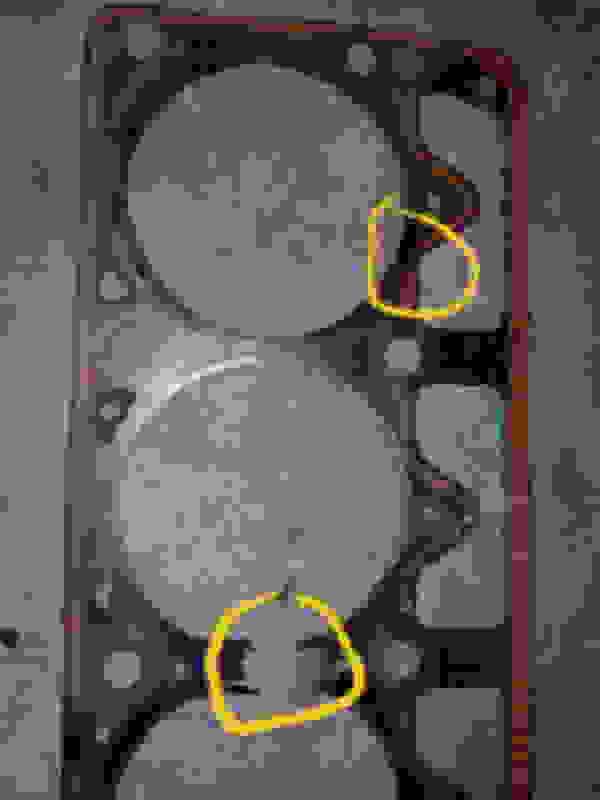 The head gasket may have failed as a result of head distortion and reduction of clamp load in that area of the gasket. The head warp condition and the extent and duration of antifreeze in the oil will be something to consider in your go-forward path. Are there signs of scoring in the cylinder bores on any sag in block deck? The block, lifters, cam and cam bearings may have all suffered. A different engine may be the best option. If you want to investigate further and still have the oil available an oil analysis can tell you something about how much wear occurred and % of antifreeze. From what I was told it blew the gasket and and was parked, would barely run because it was on 3 cylinders. I've looked at the deck and couldn't find any cracks and I looked down the sides of the block inside the water jackets the best I could also, still no cracks. I've not put a strait edge on the deck yet but I have on the head and it's most definitely warpped. I'm hoping that its mixed oil and water between the head and block since the head is warped. I'm going to a pull apart yard in the morning to try and find a head. I'll post up what I figure out with this thing. No there aren't any signs of scoring they actually look pretty good and had no ring lip at the top of the cylinders. A couple pistons look almost new from coolant being leaked and burned in them, it broke up the carbon on them. It seems that the 4.0 heads are usually pretty robust except for the 0331 heads from 2000 and 2001. The crack as you show it is a bit puzzling if it did not overheat significantly. Or could it have been worked on previously and not done correctly, such as head bolts improperly torqued or old gasket material not properly cleaned up? Was radiator full of antifreeze? Oil smell unusual? I am wondering if you got the entire story from seller. here is a pic of the deck and pistons. Third coast I bought the jeep from a buddy of mine who done some trading and ended up with it the way it sits. As far as coolant in the rad there was none when I pulled the bottom hose off. Dont know if its was burnt or already drained but when i say none i mean not a drop came out. As far as the smell goes i actually cant smell i was in head on collision in a cj5 i had about 9 years ago and i lost my sence of smell. When I took it apart I could tell someone had the header off at some point but by the looks of the head bolts when I took them out it doesn't seem like the head has been off before. A few more photos would be interesting to take a look at. Cracks can be very difficult or impossible to see without evaluation beyond visual. On the cylinder walls can you see the original hone swirls/marks? If you can that is one indicator that the block is not significantly worn and at end of life aside from the other concerns. Are oil passages relatively free of sludge and heavy buildup – another sign of a cared for engine. Does the head gasket look a little too clean and did it come away from the head/block without sticking? If yes it may have been replaced recently in a quick attempt to fix a more significant problem. Any signs of a block sealer used in the antifreeze? 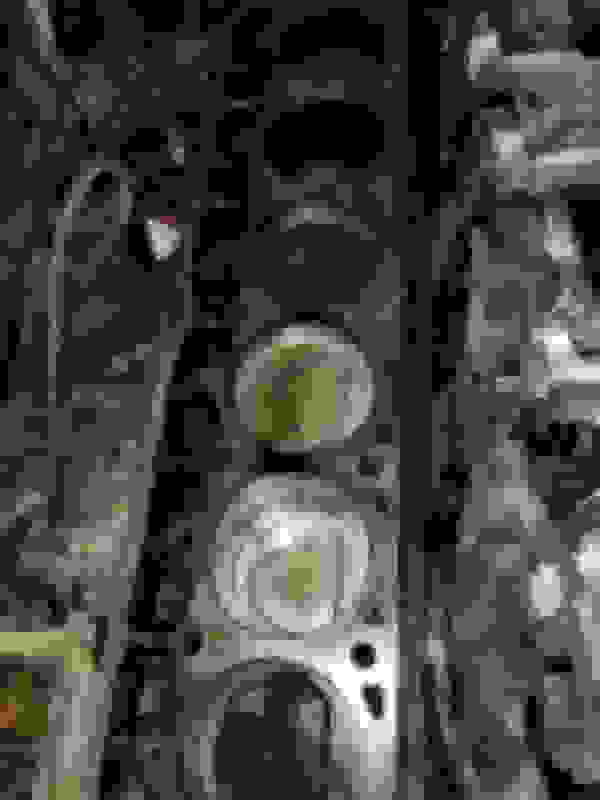 In that case the antifreeze may look very cloudy with heavy gunk present. I am out of sync with your posts. Sorry. Those two supper clean pistons are interesting. Seems like water/antifreeze had been getting in there for some time to do that much cleanup? ?